The fourth data pack of the season will be released next Thursday for PES 2015. Confirmed for March 12, Data Pack 4 will implement all moves completed in the January transfer window, as well as adding new boots, match balls, player faces and updated kits. Next-gen users will also be able to take advantage of three new stadiums. Read on for our quick fire summary or scroll down to read the full press release. - All deals completed in the January transfer window are now reflected in all game modes. Player ratings have also been updated. - 63 new player faces added for the likes of Paco Alcácer, Harry Kane, Paulo Dybala, Javier Pastore, Nathaniel Clyne, and many more. Go here for the full list. 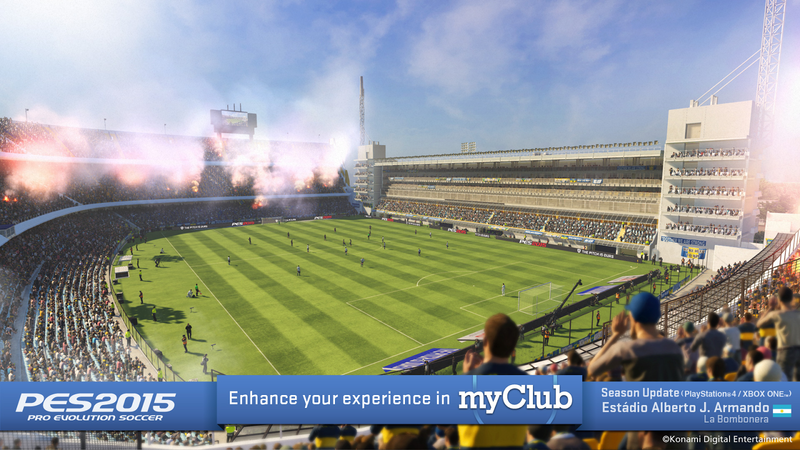 - Three new stadiums for PS4 and Xbox One - including La Bombonera, the home ground of South American giants Boca Juniors. 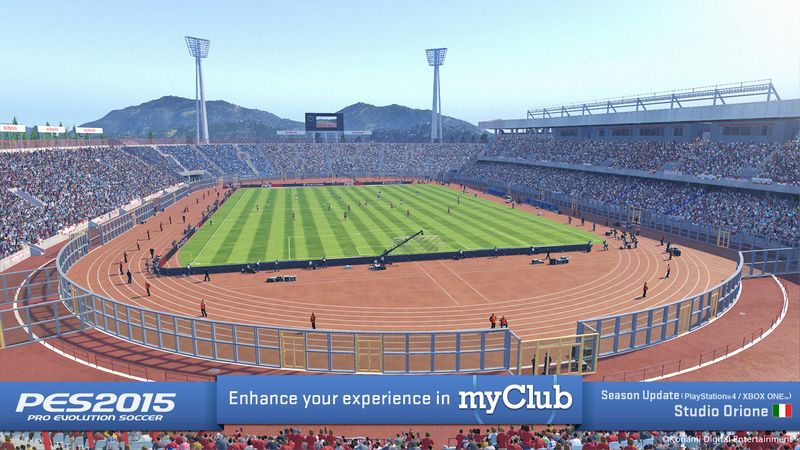 PES classics Burg Stadion and Stadio Orione also return. - Updated kits and 11 new boot styles - Adidas Predator Instinct and Adizero F50, Nike Tiempo and Puma Evospeed 1.3 all confirmed. - Official match balls added for the Argentine Primera División (Adidas Argentum) and the 2015 UEFA Champions League Final (Adidas Finale Berlin). Konami Digital Entertainment B.V. today announced the content updates coming in the free Data Pack 4 download for PES 2015, named IGN’s Best Sports Game of 2014 and the Best Sports Game at the global games conference, gamescom. This update includes the latest rosters across all modes in the game, improves a number of player likenesses, adds new stadia and kits, and implements the latest boots and balls from a number of key suppliers. Data Pack 4 will be released globally on March 12. 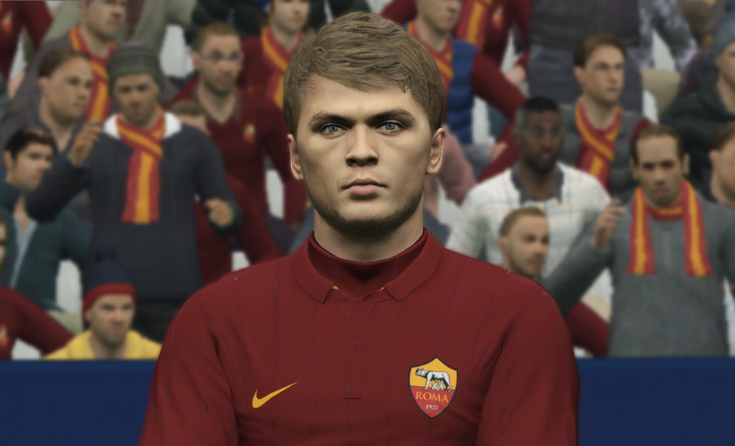 The latest free update for PES 2015 continues to add more realism. First, the download keeps the game updated with real-time league changes, implementing player transfers made within the January window. Player ratings have also been updated. Additionally, a number of improved likenesses to key players will be implemented. In line with PES 2015’s reputation for stunning physical and aesthetic reproduction of the sport’s greatest stars, the new data pack adds over 60 new faces from some of this season’s top players, as well as some new stars who have recently exploded onto the scene. These include Paco Alcácer, Harry Kane, Paulo Dybala, Javier Pastore and Nathaniel Clyne. 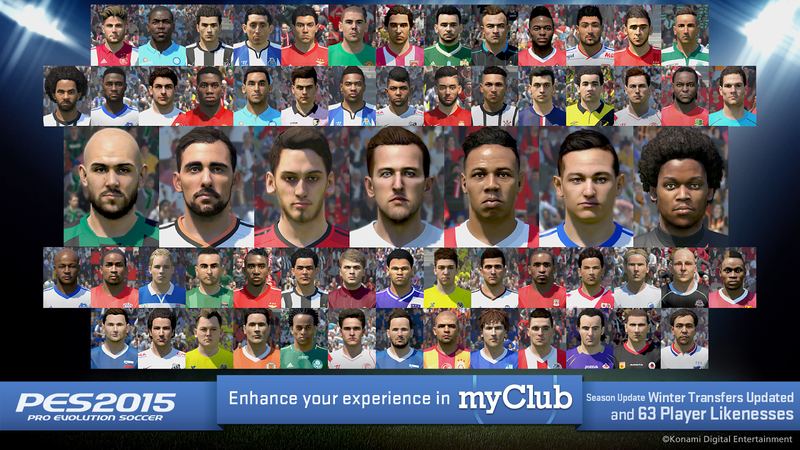 Since launching PES 2015, KONAMI has added over 200 new players to the game and continues to work with the fan community to select additional players for future inclusion. Other additions include three additional stadia, as well as updates to kits and equipment. One of the new stadiums is Estadio Alberto J. Armando, also known as ”La Bombonera.” All of the stadia have been faithfully modeled after their real life counterparts and will be available for the PlayStation®4 and Xbox One™ systems. Additional updates deliver 11 new boot styles, including adidas’ Predator Instinct and adizero f50 designs, alongside Nike’s Tiempo and Puma’s evoSPEED 1.3 pairs. The new adidas argentum ball will also be available, as is the official match ball of this year’s UEFA Champions League Final. ”The Pitch is Ours” is the ethos for PES 2015 and the aim in this year’s installment has been to recreate the drama and tension associated with a vital match. PES 2015 marks a concerted return to core PES values of total control, utterly responsive controls, and unrestricted gameplay, where the user has complete control over how they play. Every pass, shot or run is finely balanced to give maximum player satisfaction within PES 2015’s on-field action. 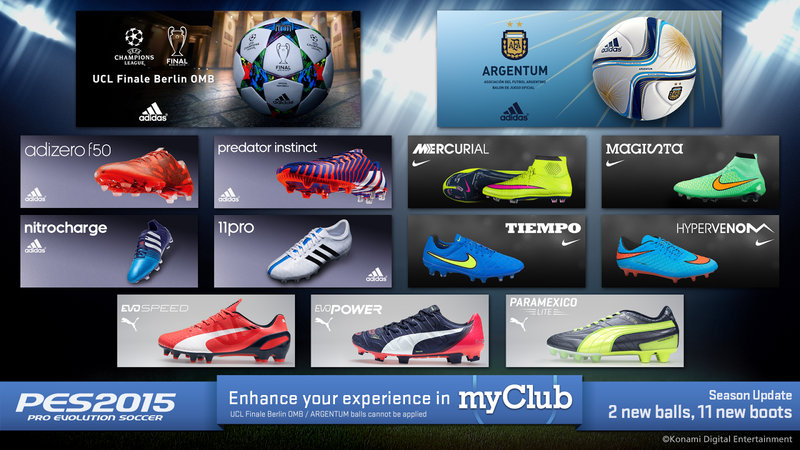 Also, PES 2015 added a new mode, myClub, where users can assemble and manage a world-class team of their own creation to compete with CPU-controlled teams offline or other real users online. 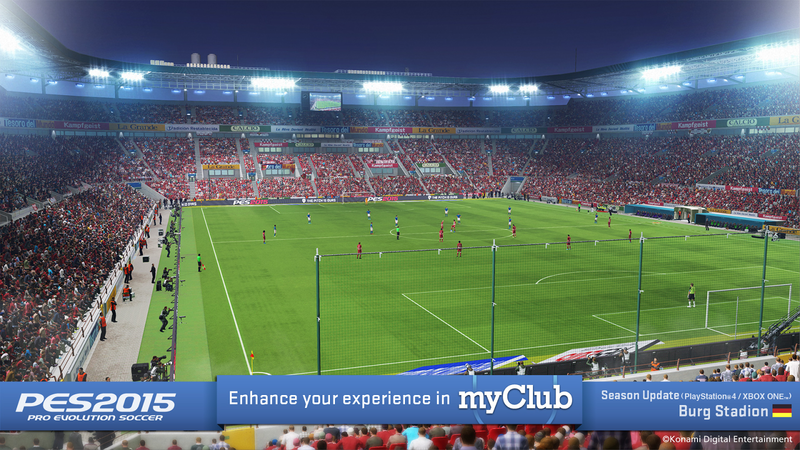 Players can advance their myClub teams through either Game Points earned by completing challenges or via myClub coins which can be purchased using real world money PES 2015 has been hailed by critics and fans as the best football game of its generation. PES 2015 is available now worldwide on PlayStation®4, Xbox One™, PlayStation®3, Xbox 360™ and Windows PC. More information is available at pes.konami.com.